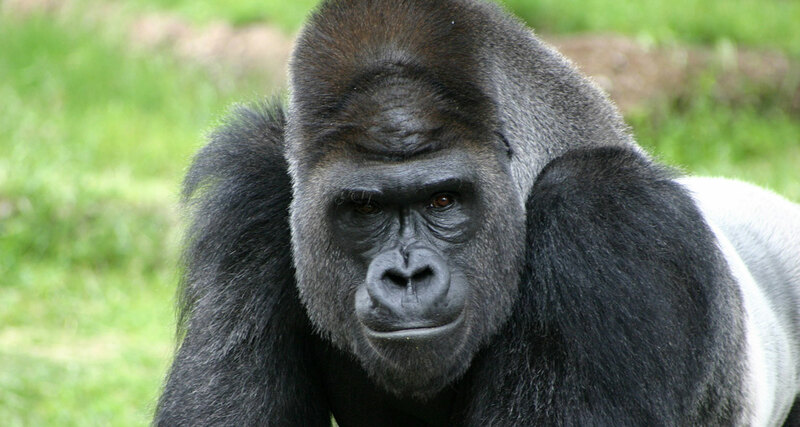 The genus Gorilla includes two species (Western - G.gorilla and Eastern - G.beringei), each of which encompasses two subspecies. The western subspecies (the Cross River and Western lowland gorillas) are found in several countries in the Western portion of tropical central Africa. Western lowland gorilla populations are estimated at approximately 125,000 animals, whereas only 250-300 Cross River gorillas are found in their relatively small (~8,000km2) geographic range straddling the border between Cameroon and Nigeria. Some studies demonstrate that G.gorilla declined >60% over a period of 20-25 years. The subspecies of the eastern gorilla include Grauer's and mountain gorillas, which are found in Uganda, Rwanda and eastern Democratic Republic of the Congo. Though it is the only gorilla subspecies not listed as Critically Endangered, Grauer's gorilla populations are estimated at only 2,000-10,000 individuals. Mountain gorillas are found in two geographically isolated subpopulations and number approximately 880 individuals. Between 2010 and 2014, 52 AZA-accredited zoos and aquariums reported taking part in a variety of field conservation projects benefiting gorillas. Over those five years alone, the AZA community invested $4.5 million in gorilla conservation. In 2010, the Ape TAG Conservation Initiative was launched by AZA's Ape Taxon Advisory Group (TAG), with the goal of increasing zoo support for ape conservation. Through the initiative, AZA institutions continually contribute resources to global ape conservation. Institutions also provide financial support to field conservation partners such as the Dian Fossey Gorilla Fund International, a charity established for the protection of endangered mountain gorillas through anti-poaching efforts and conservation education programs. Learn more about these projects, along with other field conservation and research efforts undertaken by AZA member institutions, by visiting AZA's Conservation and Research Database. Institutions report projects and update existing projects on a yearly basis, and these data are used for AZA's Annual Report on Conservation and Science and related publications. The primary threats to Western lowland and Cross River gorillas are poaching, habitat loss and fragmentation, and the Ebola virus. Where Ebola outbreaks occur, mortality rates in gorillas are as high as 95% and it is thought that all protected areas with populations of animals are at risk of being affected. Timber harvest has increased in their range in the past 2-3 decades, and with it roads have been built in areas previously inaccessible to hunters, resulting in disastrous impacts on gorilla populations. These threats are thought to be worsening rather than improving, and are exacerbated by a very low reproductive rate. Cross River gorillas are further threatened by potential inbreeding and loss of genetic diversity associated with small population size as well as encroachment by human settlement. Grauer's gorillas are also affected by habitat loss and fragmentation, with a similar result of increasing access for and incidence of hunting and capture of infants. Political instability and associated military activity have been and are currently a threat to both mountain and Grauer's gorillas in portions of their range. Though ecotourism is an important component of mountain gorilla conservation, this subspecies is at risk of human-gorilla disease transmission during these activities. For more information about AZA SAFE and its commitment to gorilla conservation, please contact SAFEgorilla@aza.org. Join the effort by making a donation to AZA SAFE.